1) In this visionary paper Robin McLaren is exploring one potential solution to the security of tenure gap through establishing a partnership between land professionals and citizens that would encourage and support citizens to directly capture and maintain information about their land rights. It was presented at the annual FIG-Commission 7 meeting last October in Innsbruck (Austria) and is the result of a common research work executed by Robin McLaren and the Royal Institute of Chartered Surveyors (RICS). The version here is slightly shortened. Only 1.5 billion of the estimated 6 billion land parcels world-wide have land rights formally registered in land administration systems. Many of the 1.1 billion slum dwellers and further billions living under social tenure systems wake up every morning to the threat of eviction. These people are the poor and most vulnerable and have reduced forms of security of tenure; they are trapped in poverty. Increasing global population and the rush to urbanisation is only going to turn this gap into a chasm. This paper explores one potential solution to the security of tenure gap through establishing a partnership between land professionals and citizens that would encourage and support citizens to directly capture and maintain information about their land rights. The paper presents a vision of how this might be implemented and investigates how the risks associated with this collaborative approach could be managed. Land Administration Systems (LAS) provide the formal governance structures within a nation that define and protect rights in land, including non-formal or customary institutions. Their benefits range from guarantee of ownership and security of tenure through support for environmental monitoring to improved urban planning, infrastructure development and property tax collection. Successful land markets depend on them. Despite this pivotal support of economic development, effective and comprehensive LAS exist in only 50 mostly western countries and only 25 percent of the world’s estimated 6 billion land parcels are formally registered in LAS. This leaves a large section of the world’s population with reduced levels of security of tenure, trapping many in poverty. Missing and dysfunctional LAS can precipitate problems such as conflicts over ownership, land grabs, environmental degradation, reduced food security and social unrest. Rapid global urbanisation is exacerbating these discrepancies. This security of tenure gap cannot be quickly filled using the current model for registering properties that is dominated by land professionals. There are simply not enough land professionals world-wide, even with access to new technologies. To quickly reduce this inequality we need new, innovative and scalable approaches to solve this fundamental problem. This is one of our fundamental global challenges. This paper explores one potential solution to the security of tenure gap: ‘crowdsourcing’. Crowdsourcing uses the Internet and on-line tools to get work done by obtaining input and stimulating action from citizen volunteers (www.crowdsourcing.org). It is currently used to support scientific evidence gathering and record events in disaster management, as witnessed in the recent Haiti and Libya crises, for example. These applications are emerging because society is increasingly spatially enabled. Establishing such a partnership between land professionals and citizens would encourage and support citizens to involve themselves in directly capturing and maintaining information about their land rights. Although citizens could use many devices to capture their land rights information, this paper advocates the use of mobile phone technology. Due to high ownership levels (5 billion licenses world-wide) and widespread geographic coverage (90 percent of the world’s population can obtain a signal), especially in developing countries, mobile phones are an excellent channel for obtaining crowdsourced land administration information. Frugal innovation is making them affordable for all, especially in developing countries where a new generation of information services in health and agriculture, for example, is turning the mobile phone into a global development tool. Mobile phones are progressively integrating satellite positioning, digital cameras and video capabilities. They provide citizens with the opportunity to directly participate in the full range of land administration processes from videoing property boundaries to secure payment of land administration fees using ‘mobile’ banking. But even today’s simpler phones offer opportunities to participate in crowdsourcing. A key challenge in this innovative approach is how to ensure authenticity of the crowdsourced land rights information. The paper explores applicability of the approaches adopted by wikis (a piece of server software that allows users to freely create and edit Web page content using any Web browser), e-commerce and other mobile information services and recommends the initial use of trusted intermediaries within communities, who have been trained and have worked with local land professionals. This approach has the potential to provide a good level of authenticity and trust in the crowdsourced information and would allow a significant network of ‘experts’ to be built across communities. To optimise the scarce resources, these intermediaries could be involved in a range of other information services, such as health, water management and agriculture. 2. ARE CURRENT LAND ADMINISTRATION SYSTEMS DELIVERING THE EXPECTED BENEFITS? Costs are significant and national solutions can take from five to over 20 years to implement. Overly complex procedures lead to high service delivery costs and end user charges, excluding the poor and the vulnerable. Lack of a supporting land policy framework ensures that the LAS do not deliver against the main drivers of land tenure, land markets and socially desirable land use. Insufficient support for social and customary tenure systems excludes large proportions of the population. Lack of transparency encourages corruption in the land sector, lowering participation through lack of trust. Communication channels to customers are either office or Internet based and lead to geographic discrimination or exclusion through the ‘digital divide’. A mortgage requires a bank account and credit rating, which is difficult for the poor and those remote from financial services to obtain. Cadastral surveys using professional surveyors are normally mandatory and generate higher fee rates, e.g. in the USA a typical residential land parcel costs $300 -$1,000 (http://www.costhelper.com/cost/home-garden/land-surveyor.html) to survey depending on local rates and the size and type of parcel. It is estimated that there are around 6 billion land parcels or ownership units world-wide. 4.5 billion parcels are not formally registered and of these 1.1 billion people live in the squalor of slums. With urbanisation predicted to increase from the current 50% to 60% in 2030 and a further 1 billion being added to the world’s population in this timeframe, the security of tenure gap will become a chasm. This will be impossible to fill in the foreseeable future using the currently available land administration capacity. The International Federation of Surveyors (FIG) currently represents 350,000 land professionals world-wide. The current LAS paradigm cannot be scaled up quickly enough to meet the demand. The lack of effective, affordable and scalable LAS solutions conspires to limit access to land administration services by large sections of society, especially the most vulnerable, leaving them trapped in poverty. There is a pressing need to radically rethink LAS: simplify procedures, reduce the cost of transactions, and open new channels for participation. Crowdsourcing through ubiquitous mobile phones, for example, offers the opportunity for land professionals to form a partnership with citizens to create a far-reaching new collaborative model and generate a set of LAS services that will reach the world’s poor. The rest of this paper explores how citizens can be empowered to support the delivery of LAS services through crowdsourcing. This section provided a vision of how citizens armed with mobile phones, with the help of land professionals, could effectively capture and manage their land rights. Recently the fastest growth has been in developing countries, which had 73 percent of the world’s mobile phones in 2010, according to estimates from the International Telecommunications Union (http://www.itu.int/ITU-D/ict/statistics/). In 1998, there were fewer than four million mobiles on the African continent. Today, there are more than 500 million. In Uganda alone, 10 million people, or about 30 percent of the population, own a mobile phone, and that number is growing rapidly every year. For Ugandans, these ubiquitous devices are more than just a handy way of communicating: they are a way of life (Fox, 2011). Not all phones in the developing world are in individual use, but are actually used as a communal asset of the household or village. Due to their high ownership levels and widespread geographic coverage, especially in developing countries, mobile phones are therefore an excellent channel for obtaining crowdsourced land administration information. But are they affordable and do they have the necessary functionality? Telecommunications has developed exponentially. Phones have changed: there is a big shift from holding a phone to your ear to holding it in your hand. Smart phones have emerged that are able to browse the web, send and receive email, and run applications - as well as storing contacts and calendars, sending text messages and (occasionally) making phone calls. See figure 1 for the range of Cyborg (an organism that has enhanced capabilities due to technology) functionality provided by smart phones. Smart phones represented 24 percent of all mobiles sold worldwide in the first quarter 2011 – up from 15 percent a year before. The tipping point when they make up 50% may only be a year or so away. Although smart phones may cost around US$600 today, volume of sales and frugal innovation will drive the cost down to an estimated US$75 in 2015. A US$100 smartphone has already arrived on the streets of Nairobi. Before the end of the decade, every phone sold will be what we'd now call a smartphone and cost US$25 (Arthur, 2011). Although smart phones have combined an array of technologies onto the mobile phone platform to significantly increase its functionality and its applicability in a wide range of new applications, regular mobile phones can still be used to support information services and gather crowdsourced information, through text messaging services (SMS) for example. The emergence of tablets is also providing an opportunity for effectively supporting crowdsourced information, especially graphical information. This technology will play a significant role in the future of crowdsourcing. (www.bristol.ac.uk/aquatest/about-project/workplan/ma6/). A similar set of land administration services for users could provide explanations of procedures, electronic forms for completion, standard applications and best practice for land registration and cadastre, for example. This remote guidance and support will be essential when there is more significant citizen participation in land administration services and could be provided by tiers of citizen intermediaries with guidance by Land Professionals. Marked up paper maps digitally photographed with the phone. A textual description of the boundaries recorded on the phone. A verbal description recorded on the phone. Geotagged digital photographs of the land parcel recorded on the phone. A video and commentary recorded on the phone – this could include contributions from neighbours as a form of verification (mobile phone numbers of neighbours could be provided). The positions of the boundary points identified and recorded on imagery using products such as Google Maps and Bing, for example. The co-ordinates of the boundary points recorded directly using the GNSS capability of the phone. In all cases the authenticity of the captured information would be enhance by passively recording the network timestamp at time of capture. This information is not something that most (99.999%) of users can tamper with. The results of this crowdsourced or self-service information could then be submitted electronically to either the land registration and cadastral authority or open data initiative for registration. Although there are limitations in the quality and authenticity of the ownership rights information provided, it could form the starting point in the continuum of rights (UN-HABITAT, 2008) being proposed by UN-HABITAT. This recognises that rights to land and resources can have many different forms and levels. To increase the authenticity and quality of the registration application, the concept of the ‘Community Knowledge Worker’ created by the Grameen Foundation (Donovan, 2011) could be adopted. The ‘Community Knowledge Workers’ are trained members of communities supporting agricultural and health information services who act as trusted information intermediaries to those who have limited skills and access to information. A similar model could be used for crowdsourced land administration services to record or check ownership rights prior to their submission. In fact, the ‘Community Knowledge Workers’ model could be extended to also support land administration information services. This model is similar to the administrative roles of the Patwari in India and the Lurah in Indonesia. This engagement of local communities is also being highlighted as a key success factor by crisis mapping projects. They realise that without community buy-in, the valuable crisis mapping tools will not be used. Communities must be engaged at all stages of the project and technical design to ensure that crisis mapping efforts are in line with local incentives and capacities. For example, this community led approach brought fourteen organisations into a network in Liberia contributing data to a multi-layered map that served as a central nervous system for early warning signs of conflict in the run up to the national elections in 2011 (Heinzelman et al, 2010). When the captured land rights are submitted to the property register (see section 4 for a discussion on an alternative shadow property register based on an open data initiative) a variety of quality checks could be applied to the submitted information, including: random checks in the field; comparisons with other applications submitted in the same proximity; checks on ownership of the mobile phone; review evidence for the location of its owner through the log showing that the phone is frequently used within a location; network time stamping of captured information; and contact the client and their neighbours on their mobile phones to ask for clarification. Further details of approaches to managing the authenticity risk are contained in section 5 ‘Managing the Risks’. Obtaining Title - The submission of an application for registration usually involves the payment of a fee. This is normally paid as cash over the counter or a financial transaction through a bank or post office. However, in the context of mobile phones, the payment could be made by the client through ‘mobile banking’ on the mobile phone. Mobile phones are currently being used to manage identification information. In Finland chip ID cards for government employees are being adopted throughout Finnish central government. It is therefore feasible that encrypted forms of land title could be incorporated into clients’ mobile phones and used as proof of ownership. Accessing Land Information - Effective LAS are supported by Land Information Systems. These are initially developed to support the internal operations of the land registration and cadastral authority. However, the next development stage is to make them outward facing and accessible by customers either by Extranet or Internet. However, with mobile phones directly supporting Internet access, these information services can now be accessed by mobile phones. This new channel, which will be the only access to the Internet for many countries, creates much more accessibility for the citizen, bringing land administration services to a wider range of society, many of whom are currently excluded. Paying Mortgage Instalments - Securing a mortgage normally requires the property owner to have a bank account to support the mortgage payments transactions. However, the mobile phone offers opportunities to provide secure payment of land administration fees with the increasing use of ‘Mobile Banking,’ simplifying the procedures and again potentially opening up the means of wider property ownership. The introduction of this new LAS model will likely be perceived by most land professionals working in the land administration sector as radical and by some as a serious threat. However, the current generation of mobile phones and other devices are increasing the potential range of participants in land administration. We are seeing the rise of the ‘proamateur’, somewhere between the professional and the amateur, caused by this easy to use and accessible technology. Disruptive technology has caused professional realignments in the past: total stations allowed surveying technicians to perform more tasks, more accurately than before. Crowdsourcing by ‘proamateurs’ is not a risk to land professionals, but allows a wider range of participants to be involved in land administration and more quickly address and solve our global challenges. Land professionals’ attitudes towards this new model will determine how land administration is shaped in the future. Here are two scenarios of the potential impact of the new model on the land administration sector. Rejection by Land Professionals: Shadow Property Register - In countries where there is little citizen trust in poorly performing or corrupt land administration services provided by the government, an alternative property register may be created through crowdsourcing. This ‘shadow’ property register would be similar to the OpenStreetMap crowdsourced model that has successfully provided an alternative source of mapping for many countries. An ‘OpenCadastralMap’ (Laarakkar and de Vries, 2010) or ‘OpenLandOwnership’ open data initiative would emerge. Despite not having the usual endorsement and guarantee from government, its legitimacy may progress over time as quality and trust evolve. It may even be embraced by the informal market as a trusted repository to support transactions more affordably and effectively than the formal property register. The real test will be if financial services use it to judge risk in the mortgage market. Ultimately, it may either replace the government land administration service, reinforcing the informal land market, or be adopted by government once it has reached a critical mass and quality. Acceptance by Land Professionals: Supplement to the Formal Property Register - Other countries may embrace this new model as an opportunity to accelerate the number of properties being registered across the country and support a much more inclusive solution to land administration. If land professionals work in partnership with citizens and communities and grow a network of trusted citizens to record and register land rights then this source of land information could be managed directly by the formal property registers. Initially these crowdsourced records could have a provisional status that would be formalised following checks on authenticity. This could be performed directly by land administration staff or accepted directly from trusted community experts or quality checks achieved through crowdsourcing. The approach to and judgement of authenticity would evolve and improve over time, just as has happened with the maintenance of all wikis. This would involve a changing role for land professionals, working with citizens rather than for citizens. In emerging nations where there are insufficient land surveyors or land surveyors do not wish to embrace a crowdsourced approach, the lawyers, assessors or even bankers may eventually try to remove or at least reduce the need for land surveyors in the property transaction by either resorting to direct crowdsourcing or identifying another type of intermediary to facilitate crowdsourcing in different communities in exchange for some cash or in-kind consideration. As with all radical changes to long standing approaches, vested interests will be jeopardised and entrenched opposition will inevitably be encountered. Here are some of the risks that will most likely be raised to attempt to keep the status quo. 5.1 Can crowdsourced land rights information be sufficiently authenticated? One of the most contentious issues surrounding crowdsourced information is the authenticity or validity of the information provided. Without the rigors and safeguards associated with formal professional and legal based processes, crowdsourced information is of variable quality and open to potential abuse. Crowdsourced information has provided input to wikis, feedback of quality of services and counting birds, for example, but is not normally used to capture information as critical and legally binding as property rights in an authoritative register. So what techniques could be used to quality assure the authenticity of the information to a level that would be acceptable for inclusion in a property register? Some alternatives, including lessons learned from leading wikis and e-commerce, are discussed below. However, the most appropriate crowdsourcing approaches to authenticity assessment will only be identified through testing in the field. This approach would avoid open, direct crowdsourcing at the outset and only allow information to be provided by trusted intermediaries within communities who have been trained and have worked with local land professionals. Initially, there would be comprehensive quality assurance of the crowdsourced information, but over time as trust is established with the intermediaries the level of quality assurance sampling could significantly decrease. These initial intermediaries could then train further experts to build a significant network of ‘experts’ across communities. Each expert would be continually checked and appraised to determine the level of expertise and trust in the associated crowdsourced information. To optimise the scarce resources, the intermediaries could be shared with a range of information services, such as health and agriculture. Quality assurance could be directly provided by members of the local communities who take direct responsibility for authenticity. The crowdsourced land right claims could be posted for communities to review and comment on. Some form of local or regional land tribunal could be established to arbitrate on conflicting claims. Once a critical mass of land rights information is obtained it is then easier to identify anomalies and conflicting claims. Levels of trust and accuracy of the land rights would be upgraded over time as more evidence and cross checking validates the claims. Beyond local involvement in quality assurance, a centralised user reputation system based on feedback from crowdsourced registrations, similar to the buyers’ ratings of the sellers used in eBay, could be used to assess the credibility of contributors and the reliability of their contributions (Coleman, 2010). Leading wikis, such as Wikipedia.org, originally relied solely upon the "wisdom of the crowds" to evaluate, assess and, if necessary, improve upon entries from individual contributors, usually with great success. However, recent contributions of deliberate misinformation to specific entries have caused Wikipedia to re-assess its approach. Beginning in December 2009, it has relied on teams of editors to adjudicate certain "flagged entries" before deciding whether or not to incorporate a volunteered revision (Beaumont, 2009). Although the data that are contributed to VGI projects do not comply with standard spatial data quality assurance procedures and the contributors operate without central co-ordination and strict data collection frameworks, research of VGI is starting to provide methods and techniques to validate quality and also the needed evidence to show that this data can be of high quality. Recent research (Haklay et al, 2010) supports the assumption that as the number of contributors increases so does the quality; this is known as ‘Linus’ Law’ within the Open Source community. Studies were carried out using the OpenStreetMap dataset showing that this rule indeed applies in the case of positional accuracy. Some elements of the quality assurance process do not require local knowledge of the land rights claim and could be crowdsourced to a network of informed consumers and world-wide professionals or could even be automated. 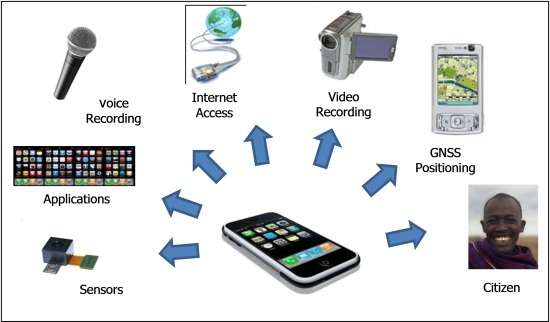 Mobile phones can also be used passively to collect evidence that supports validation of user entered information. For example, the use of a mobile phone is continually logged and this log can be analysed to show where the phone is frequently used, inferring the location of the owner. The network timestamp is another robust piece of evidence that could be associated with collected land rights data, such as images or videos. This is not something that most (99.999%) of users can tamper with. The extent to which control is held by the contributor, by the institution, or by "the crowd" of contributors assessing each other's contributions may be different across different implementations of crowdsourcing. 5.2 Will openness lead to more corruption in the land sector? Land administration is often perceived as one of the most corrupt sectors in government. Although individual amounts may be small, petty corruption on a wide scale can add up to large sums. In India the total amount of bribes paid annually by users of land administration services is estimated at US$ 700 million (Transparency International India, 2005), equivalent to three-quarters of India’s total public spending on science, technology, and the environment. However, one of the best means of reducing corruption within a good governance framework is through transparency of information and the ability to have two-way interaction with clients. Data collected by the public must be validated in some way, otherwise the crowdsourced information is open to abuse, and in the case of land rights, corruption through false claims. However, transparency, which is at the heart of the crowdsourced philosophy and the increasing use of the mobile phone to check authentication, should support a fight against corruption. 5.3 Will Land Professionals form a new partnership with citizens? This new partnership model implies that Land Professionals will have a different relationship with citizens or ‘proamateurs’. The increased collaboration with citizens opens up the opportunity for new services to train citizens and community intermediaries and to quality assure their crowdsourced information. It should therefore not be perceived as a threat to their livelihoods and profession. But will Land Professionals accept this new role and will sufficient citizen entrepreneurs provide land rights capture services and become trusted intermediaries? Disruptive technologies have and will continue to challenge the relationship between ‘proamateurs’ and land professionals, but these drivers of change also present significant opportunities for all stakeholders. 5.4 Will crowdsourcing just reinforce the informal land market? There is a danger that the emergence and acceptance of crowdsourced land rights information by citizens will just reinforce the informal land markets in countries where there is ineffective land governance, poorly performing land administration systems and weak formal land markets. Lack of trust in the formal land administration system will persuade citizens to try crowdsourcing alternatives that are attractive due to their transparency and citizen involvement. The final outcome of the informal or formal market will depend on the Land Administration agencies’ reaction to crowdsourcing and whether they reject or embrace it. 5.5 Who will provide the ICT infrastructure to support this initiative? The implementation of crowdsourcing in land administration requires technical infrastructure to support the uploading, management and maintenance of the land rights information. The implementation could mirror the voluntary support model of OpenStreetMap. OpenStreetMap's hosting, for example, is supported by University College London’s VR Centre for the Built Environment, Imperial College London and Bytemark Hosting, and a wide range of supporters (http://wiki.openstreetmap.org/wiki/Partners) provide finance, open source tools or time to support the initiative. Crowdsourcing within the emerging spatially enabled society is opening up opportunities to fundamentally rethink how professionals and citizens collaborate to solve today’s global challenges. This paper has identified land administration as an area where this crowdsourced supported partnership could make a significant difference to levels of security of tenure around the world. Mobile phone and personal positioning technologies, satellite imagery, the open data movement, web mapping and wikis are all converging to provide the ‘perfect storm’ of change for land professionals. The challenge for land professionals is not just to replicate elements of their current services using crowdsourcing, but to radically rethink how land administration services are managed and delivered in partnership with citizens. Land administration by the people can become a distinctly 21st century phenomenon. Al- Omari, M. 2011. “Land Administration Systems and Land Market Efficiency”, FIG May 2011, Morocco FIG Working Week. Arthur, C. 2011. “How the smartphone is killing the PC.” Guardian Newspaper, 5th June 2011. Retrieved from http://www.guardian.co.uk/technology/2011/jun/05/smartphones-killing-pc. (Last accessed 10 August 2011). Beaumont, C. 2009. "Wikipedia ends unrestricted editing of articles". The Telegraph. 26th August 2009. Retrieved from http://www.telegraph.co.uk/technology/wikipedia/6088833/Wikipedia-ends-unrestricted-editing-of-articles.html. (Last accessed 11 August 2011). Donovan, K. 2011. “Module 6: Anytime, Anywhere: Mobile Devices and Services and Their Impact on Agriculture and Rural Development”, “ICT in Agriculture” e-sourcebook. World Bank. To be published September 2011. Enemark, S., van der Molen, P. and McLaren, R. 2010. “Land Governance in Support of the Millennium Development Goals: Responding to New Challenges,” Report on FIG / World Bank Conference Washington DC, USA 9-10 March 2009, FIG Publication. Fox, K. 2011. “Africa's mobile economic revolution”, The Observer Newspaper, 24 July 2011. Retrieved from http://www.guardian.co.uk/technology/2011/jul/24/mobile-phones-africa-microfinance-farming. (Last accessed 12 August 2011). Haklay, M., Basiouka, S., Antoniou, V. and Ather, A., 2010. “How Many Volunteers Does It Take To Map An Area Well? The Cartographic Journal, 47 (4), pp 315 – 322. Heinzelman, J., Sewell, D.R., Ziemke, J. and Meier, P. 2010. “Lessons from Haiti and Beyond: Report from the 2010 International Conference on Crisis Mapping”. Retrieved from http://www.usip.org/files/resources/PB83.pdf. (Last accessed 17 August 2011). Laarakkar, P. and de Vries, W.T., 2010. “www.Opencadastre.org - Exploring Potential Avenues and Concerns”. FIG May 2011, Morocco FIG Working Week. UN-HABITAT. 2008. “Secure Rights for All,” United Nations Settlement Programme (UN-HABITAT)2008, ISBN: 978-92-1-131961-3. Zimmerman, W. 2011. Private correspondence. Robin McLaren is director of Know Edge Ltd a UK based, independent management consulting company formed in 1986. The company supports organisations to innovate and generate business benefits from their geospatial information. Robin has supported national governments in formulating National Spatial Data Infrastructure (NSDI) strategies. He led the formulation of the UK Location Strategy and has supported similar initiatives in Kenya, Hungary, Iraq and Western Australia. He has also supported the implementation of the EU INSPIRE Directive in the UK and was recently a member of the UK Location Council. Robin is also recognised as a world expert in Land Information Management and has worked extensively with the United Nations, EU and World Bank on land policy / land reform programmes to strengthen security of tenure and support economic reforms in Eastern and Central Europe, Africa, Middle-East and the Far-East.